Dessert tea, also known as dessert blends, are tea blends with an emphasis on sweet flavors. This style of tea is a relatively new trend. Dessert teas appeal especially to soda, flavored latte and non tea drinkers for their sweetness and smooth flavors. Typical flavors of dessert blends can include chocolate, vanilla, cinnamon and other spices, flowers, nuts and fruits. Black tea is typically used as the base for these types of teas. However, the use of other teas as a base is gaining popularity. Cream or milk is often added when served. Sugar or sweeteners are added by the drinker to their taste preference. Since tea in general has a wide variety of flavors, it makes it easy to find a great dessert tea to pair with dishes. Dessert tea can be served as a compliment to a meal or dessert. It can also serve as a stand alone menu item as an alternative to high calorie desserts. Here, at Carbo-Mix we offer Shangri-La premium organic teas in bags and silken pyramid sachets. Their Decadent Coconut Chocolate silken pyramid sachet tea is an ideal dessert tea flavor with mass appeal. In fact, many of our tea customers frequently order this flavor. This exquisite blend of organic black tea, coconut and chocolate is sure to be a customer favorite. We recommend serving sweetened with a splash of milk or cream. 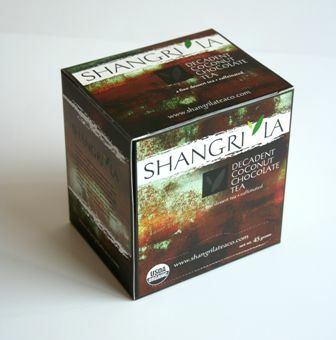 We also carry other Shangri-La flavors that would be an excellent dessert tea choice. Interesting in trying our tea? Contact Us for more information. We look forward to hearing from you!